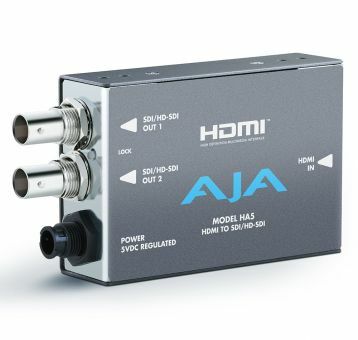 The HA5 converts HDMI to SDI or HD-SDI. Up to eight channels of HDMI audio are embedded into the SD/HD-SDI output allowing a convenient single cable audio/video connection. HA5 provides two SD/HD-SDI outputs and supports long HDMI cables on the input. The HA5 is useful for connecting HDMI cameras to SD/HD-SDI equipment.